Sic Bo (“Precious Dice”) is an old Chinese game, which is played with three dice. In the Western countries the game is also known as Grand Hazard, Chuck-a-Luck or Birdcage. There can be differences in wagers and payouts in various casinos, regions or countries (Europe, USA, Asia). 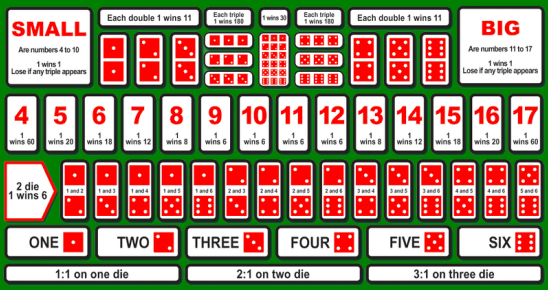 One thing the games have in common – players can wager on various combination of three dice. Sic Bo, also known as Tai Sai, Dai Siu, Big or Small or Hi-Lo is a casino game, which is popular mainly in Asia (Macao or the Philippines). However the game has spread over the world. The game was brought to the United States by Chinese immigrants on the beginning of 20th century and today we can find it in almost all American casinos. As it was mentioned above, Grand Hazard and Chuck-a-Luck are English variations based on the Chinese Sic Bo, while, to keep the succession, Chuck-a-Luck (or Chuckluck) already comes from Grand Hazard. The players can wager on varied combinations of three dice, which are usually churned in a glass crucible known as Chuck Cage. This type of games is very quick and exciting, nevertheless the games offer quite disadvantageous payouts. The popularity of the games may result from several reasons: the players simply like gambling, or either they do not know the true odds or they might be discouraged by seeming complexity of the king of the dice games – Craps. Sic Bo table is illustrated on the picture below. In comparison to the games with two dice there are logically some new wagers. For instance you can bet on a specific Triple (also known as „Raffle“, „Trio“, „Treble“ nebo „Prial“), which means that the same number has to occur on all three dice, e.g. 3 sixes. You can also bet on Any Triple or a specific value (sum) of three dice. Some of the wagers and their low payouts give house a big advantage up to 30% – see the table below. Another specific wager is that some number will appear at least on one die, then the payout is 1:1. If the number appears on two dice or three dice, then the payout is 2:1 or 3:1. This wager seems to be very reasonable at first sight, but it gives house the edge 7.9%. These six simple wagers are the only ones in some variation of these 3-dice games. This game is called Chuck-a-Luck in Nevada. Crown and Anchor is played in UK and Australia – the game is the same, but there are 6 symbols instead of numbers – crown, anchor, hearts, diamonds, spades and clubs (the last four are the same symbols as in card games). The most advantageous wagers are Small (4–10) and Big (11–17), Even and Odd numbers with the payout ratio 2:1. These wagers lose if any triple occurs. The true odds are 111:105, which brings house a reasonable profit 2.8% (from the view of the players). As it can be seen in the table above, the games of branch like Sic Bo, Grand Hazard and Chuck-a-Luck offer a great variety of wagers. However at the same time it is necessary to know the true odds and pay attention to the payouts, since some of the wagers are obviously disadvantageous and give house an extremely great advantage. The house advantage can be calculated on the basis of the expected value (see the exhibits).